The three b's: Karma, Dio and Tao: Tao the junior! Tao's 9 month birthday was on Sunday 14.9. and as it happens, there was an all breeds show that day in Porvoo. 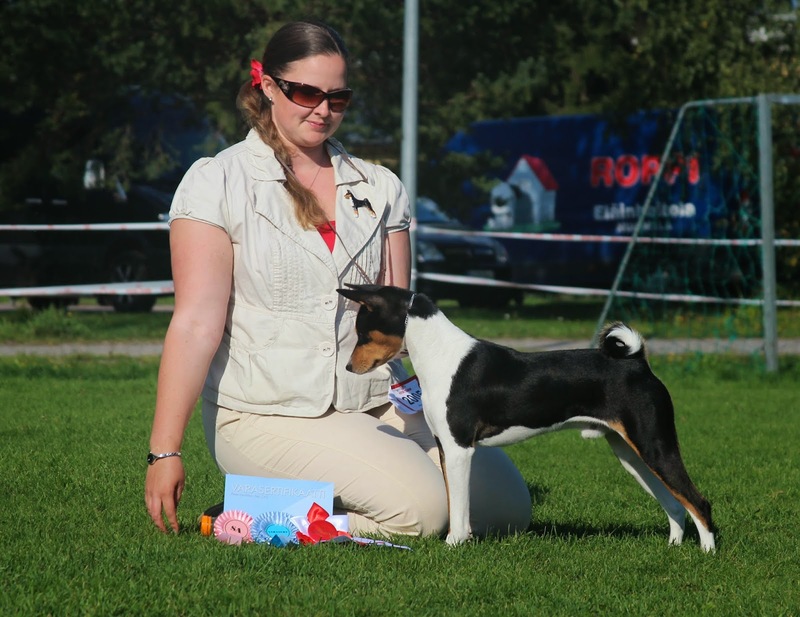 Naturally I "had to" enter him to the show, first time as a junior :) There were 17 basenjis entered and junior males (2) were of course first in the ring. Tao wanted to look behind him and play with the other junior male when we tried to run around the ring but othervise he was a very good boy. Judge gave him Excellent with CQ and he won the class. As there were no female juniors, this made Tao BOB-junior! And it didn't end there... All but one male got the CQ (very silly, I think) so the Best male ring was crowded. Judge really seemed to like Tao since he first made the cut to the four best males and was finally awarded Best Male 3 and a resCAC! What a smart boy! This show also had a BIS competition for the BOB-juniors so we had to wait a couple more hours. The pre-judging ring was way too small for all the 100 or so juniors so I have no idea how the judge was supposed to have a proper look at all the dogs. Even in the actual BIS ring there was not enough space for everyone and we had to make two lines. I was with Tao at the end of the first line so we barely had room to take two steps running in the big ring before we already had to stop. A real shame!! We didn't make the (no surprise there really) but I was very pleased with Tao's performance and behaviour throughout the day. He is such an easy, laid-back, friendly and cool guy!